Dimensions 1.50 by 5.50 by 8.25 in. A sanitorium in the Swiss Alps reflects the societal ills of pre-twentieth-century Europe, and a young marine engineer rises from his life of anonymity to become a pivotal character in a story about how a human's environment affects self identity. Amazon.com description: Product Description: In this dizzyingly rich novel of ideas, Mann uses a sanatorium in the Swiss Alps--a community devoted exclusively to sickness--as a microcosm for Europe, which in the years before 1914 was already exhibiting the first symptoms of its own terminal irrationality. 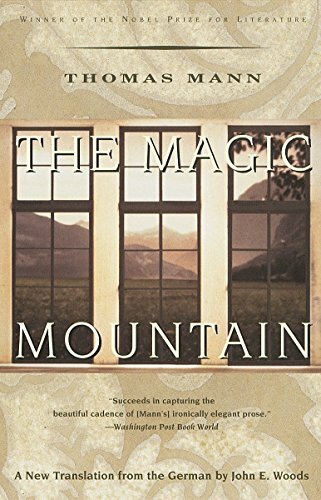 The Magic Mountain is a monumental work of erudition and irony, sexual tension and intellectual ferment, a book that pulses with life in the midst of death. About: A sanitorium in the Swiss Alps reflects the societal ills of pre-twentieth-century Europe, and a young marine engineer rises from his life of anonymity to become a pivotal character in a story about how a human's environment affects self identity.